It’s common wisdom that if global warming is to be held to no more than 2 degrees Celsius in this century—the internationally agreed-upon target—getting China and India to rein in their greenhouse gas emissions will be crucial. China surpassed the United States as the world’s top emitter a decade ago, its emissions are now twice America’s, and if business goes on as usual its emissions could be more than three times higher by 2030. India appears to be on a similar trajectory, with a lag: By the end of the next decade it will be the world’s second biggest emitter. The main source of emissions in both countries is coal combustion for electric power generation. During the last decade, each year China was adding coal capacity equivalent to the entire British power sector. India’s official plans call for the country’s coal consumption to be doubled in the next years and perhaps tripled by 2030. In early November, the New York Times reported that official Chinese estimates of its coal emissions were even higher than previously stated, based on a newly released statistical abstract. Actually the higher numbers had already been issued earlier this year. But the Times report did draw attention to the scale of the China problem: the difference between the newer and older estimates is roughly the equivalent of one year’s emissions in Germany. A year ago, in a breakthrough bilateral agreement with the United States, China agreed to have its emissions peak no later than 2030. Because of China’s size, that kind of discrepancy is nothing new. Many organizations have come up with independent estimates of Chinese emissions on an ongoing basis, among them the Lawrence Berkeley National Laboratory, the U.S. Energy Information Administration, and scholars at MIT and Harvard. Differences between the higher and lower estimates of yearly emissions have been equivalent to Japan’s greenhouse gas emissions. A year ago, in a breakthrough bilateral agreement with the United States, China agreed to have its emissions peak no later than 2030. This was a deemed a breakthrough because previously the Chinese leadership had refused to consider making any kind of firm pledge about their future emissions. Under the terms of the 1992 Framework Convention on Climate Change, which is the foundation of all climate diplomacy, only the advanced industrial countries were required to make specific cuts, at least initially. At the 2009 Copenhagen climate conference, the United States in effect rejected a future program in which only the world’s richest countries would be required to make cuts, and instead won the world’s very reluctant acceptance of a system in which all countries instead would make voluntary emissions pledges. The bilateral U.S.-China agreement was the first fruit of that agreement. Since then, almost all countries have made pledges to the United Nations in the form of so-called Independent Nationally Determined Contributions (INDCs). 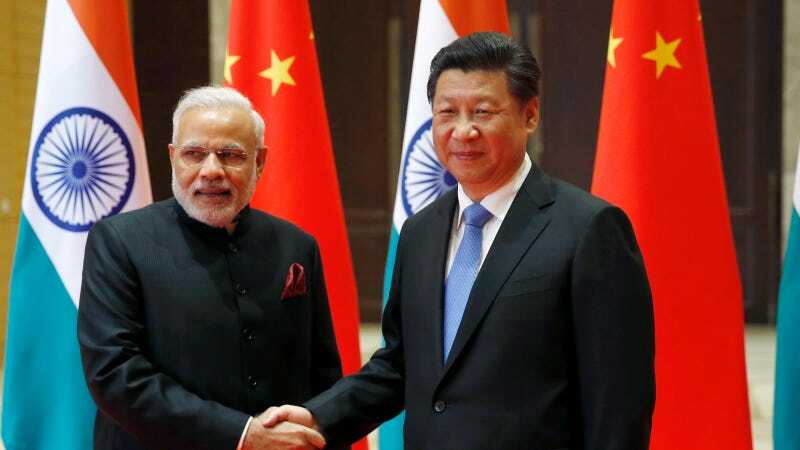 Among the major emitting countries, China was among the first to submit an INDC, and India was the last. Surveying the Chinese and Indian pledges, the official rhetoric is strikingly different. The contrast in attitudes mainly reflects the radically different stages of economic development and prosperity the two countries have attained. But there also is an element of diplomatic stubbornness in India’s position, which has been an abiding characteristic of the country’s diplomacy from the earliest years of independence. India’s projected future appears to be unsustainable in the literal sense of the term. India’s INDC, on the other hand, opens with a lot of rather sophomoric feel-good statements about humanity, Mother Nature, and harmony, with quotations from Gandhi. It then assumes a distinctly can’t-do tone: “The average annual energy consumption in India in 2011 was only 0.6 tonnes of oil equivalent (toe) per capita as compared to global average of 1.88 toe per capita,” clearly implying that boosting per-capita energy consumption, not greenhouse gas reduction, is its priority. As of 2013, the United States had a HDI, a measurement of key dimensions of human development, of 0.914. Norway had the highest with 0.944. China's was 0.719 and India's was 0.586. Though India’s INDC does eventually get down to specifics, they gloss over as much they reveal. What is said is that there will be a concerted effort to boost solar and wind capacity, as well as other renewables, and to improve energy efficiency, so that by 2030 the country’s emissions intensity—emissions per unit GDP—will be 33-35% lower than in 2005. What it does not say but does clearly imply is that coal still will account for nearly three fifths of its power generation. The INDC, unlike China’s, makes no promise about when emissions will peak. Remember, says the INDC at the conclusion of this argument, half of what India will be in 2030 has yet to be built. Admittedly India is in a very difficult situation. If for example it is to avoid being awash in cars in the near future it will need to emphasize mass transit and railroads, points out economist Rakesh Mohan, who led a major transportation study for the India government. But rail systems require electric power, so their rapid expansion also implies a two- or three-fold increase in coal combustion. Taking all these factors into account—the need for economic growth, air pollution from coal and cars, expansion of mass transport, still more coal combustion—India’s projected future appears to be unsustainable in the literal sense of the term. In projecting such self-destructive increases in coal, which follow ineluctably from current trends, “we’re certain we’ll be wrong, we’re bound to be wrong,” comments Mohan, now a member of the governing board at the International Monetary Fund. Somehow countries like India need to be persuaded and helped to surmount such herculean problems. Somehow countries like India need to be persuaded and helped to surmount such herculean problems. A key element of the Paris agreement to be negotiated next month will be provisions for regular review of nations’ pledges, so that sustained peer-group pressure can be brought upon leaders of foot-dragging states to continuously boost their ambition and performance. On Nov. 2, as part of global full-court press in climate diplomacy, French President Francois Hollande got China’s leaders to agree in Paris on a five-year cycle of pledge reviews. That is an important step forward, not just because of China’s pledged reductions, but because the world’s aggregate pledges are far short of getting on a path that will keep global warming below two degrees Celsius in this century, the internationally agreed-upon goal. Assessments of the combined pledges vary, making for a classic glass-half empty/glass half full situation. Announcing the UN’s assessment ten days ago, UN climate chief Christiana Figueres said they would limit warming to 2.7 degrees Celsius by 2100—a significantly better result, it seems safe to say, than most independent experts would have predicted. But not all such experts bought the UN’s claim. Joseph Romm of ClimateProgress has said the correct number is more like 3.5 degrees Celsius, and he is not alone. Bill Sweet is completing an analytic history of climate diplomacy from 1990 to 2015, to be published next year. He covered the Copenhagen conference and will be at Paris. A science and technology journalist with 40 years' experience. Currently a history adjunct in the CUNY system and at work on a book about climate diplomacy.